"This icing is delicious spread over cookies or cupcakes." Mix butter, powdered sugar and vanilla together. Add teaspoons of hot water until you reach your desired consistency for spreadable icing. Spread icing over the Sour Cream Cookies. This icing is great if you need something that dries quickly so you can stack cookies on top of each other. Perfect! 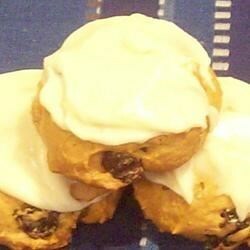 Quick and easy and tastes great with the sour cream cookies. Which are my husbands favorite!! i'm sorry to say, but to me this tasted like butter. i had to throw it out and not put icing on the cookies. but it was easy to make and it looked nicer than the usual glaze.